Indian cuisine has played a very prominent role in my relationship with food; in my family, roughly 9/10 special occasions were marked by a visit to one of the local Indian restaurants; as I grew into my mid-teens and my parents spent more evenings/nights out, it was my go-to accompaniment for Friday night television. Perhaps most importantly, though, it was what truly got me into cooking. 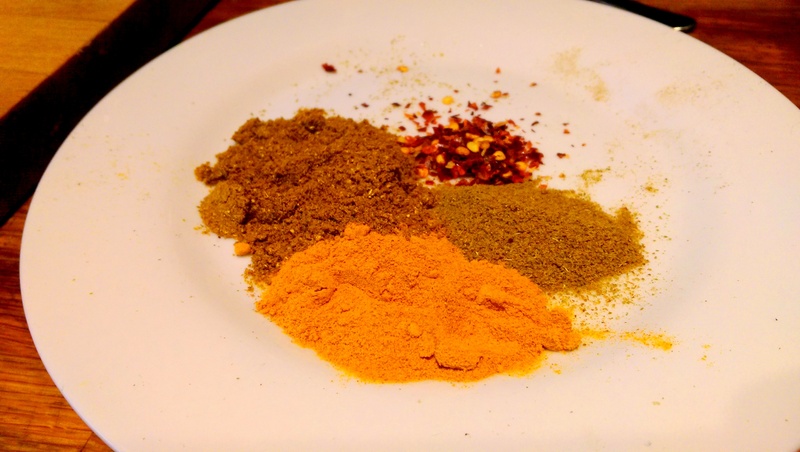 As a teen I was always searching out and trying new curried dishes, learning about spice combinations and eventually understanding the way in which so much of cooking is based around learning the basic blueprint, after which you can pretty much fill in the gaps with whatever you like. 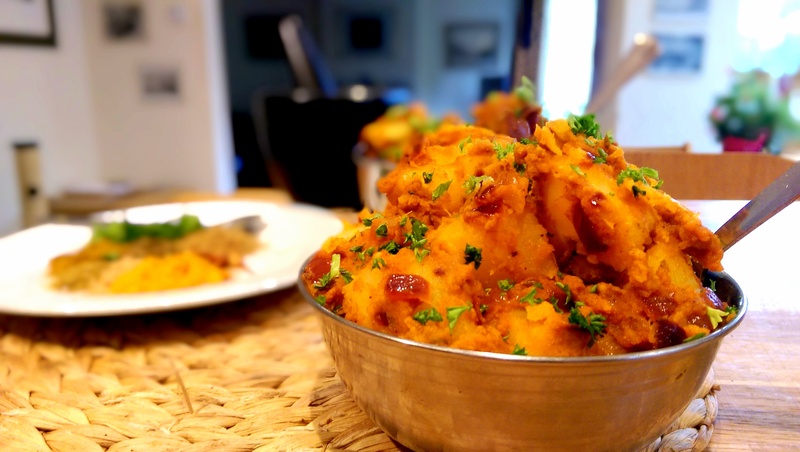 Bombay Aloo is tied with Matar Paneer as my favourite Indian side dish. The trusty potato – filling and perfect at truly absorbing the wealth of flavour brought to the sauce by those wonderful herbs and spices. 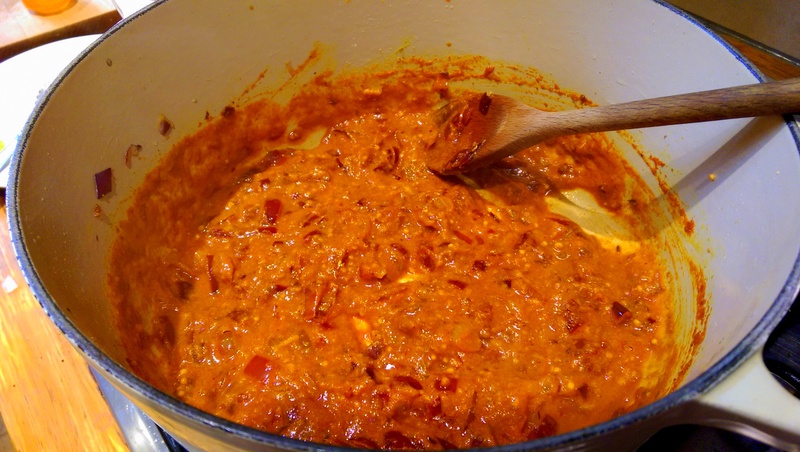 You can adjust the recipe to be as spicy or mild as you like by adjusting the quantities of chili and yoghurt. 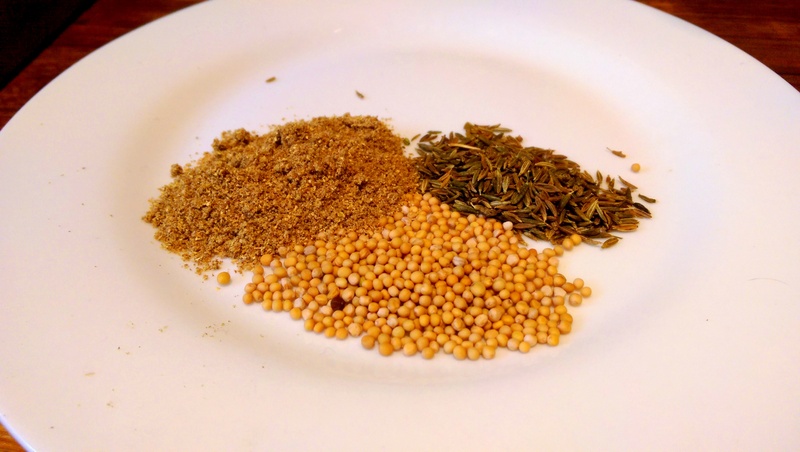 Though the ingredient list may look long for a simple recipe, remember that you’ll have most of these things hidden amongst your spices, and it’s just a teaspoon or two each. 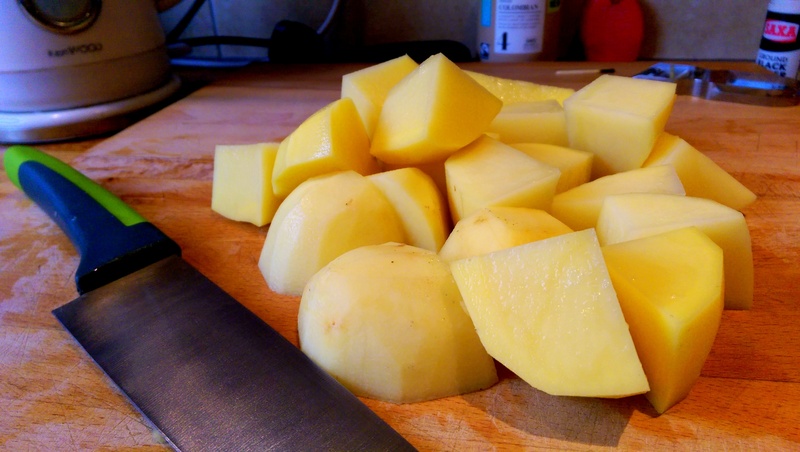 Slice your potatoes into fairly small cubes – roughly bite size. Boil in hot water until you can pierce them with a knife with almost no effort. Don’t boil too much or they’ll just turn to mush later. 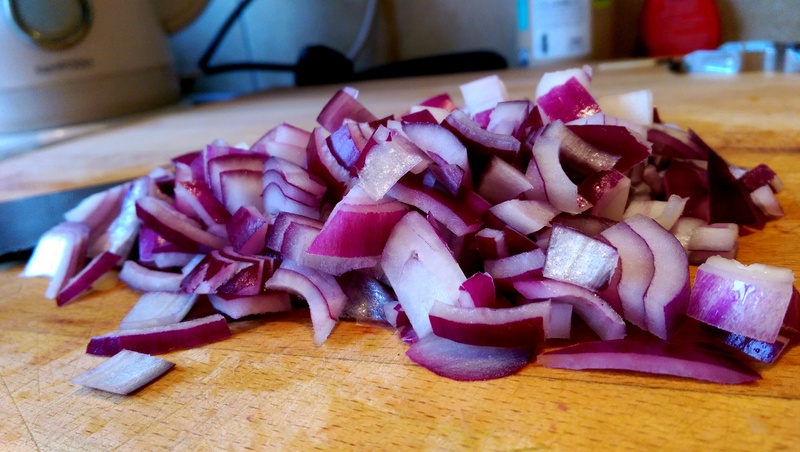 Dice the onion and fry in oil for a few minutes, until turning translucent. 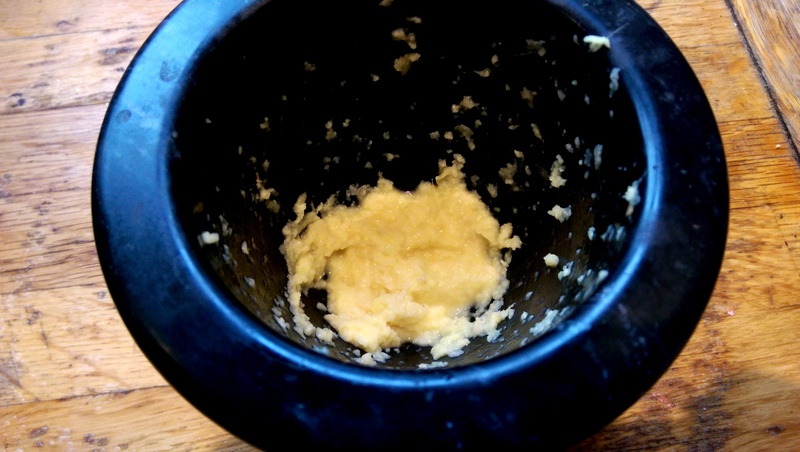 While this happens, grate the ginger and mash with the garlic in a pestle and mortar. Add a little salt and water to help the process along. 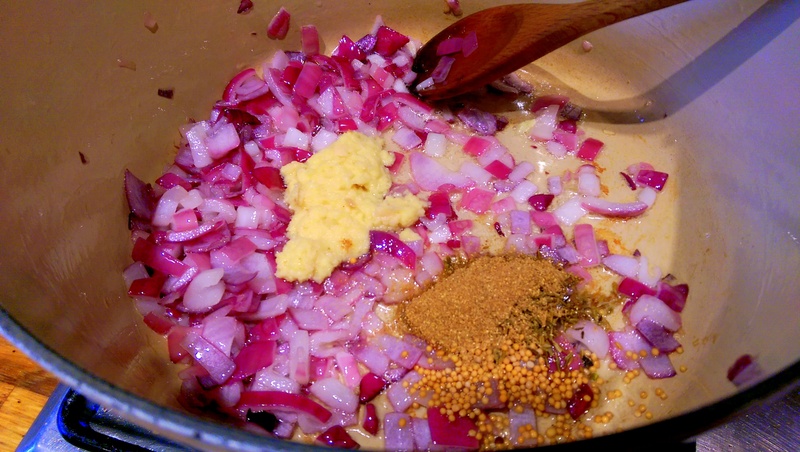 Add the garlic/ginger paste, mustard seeds, cumin seeds and ground coriander and stir through well. Cook until the seeds are beginning to pop and crackle. 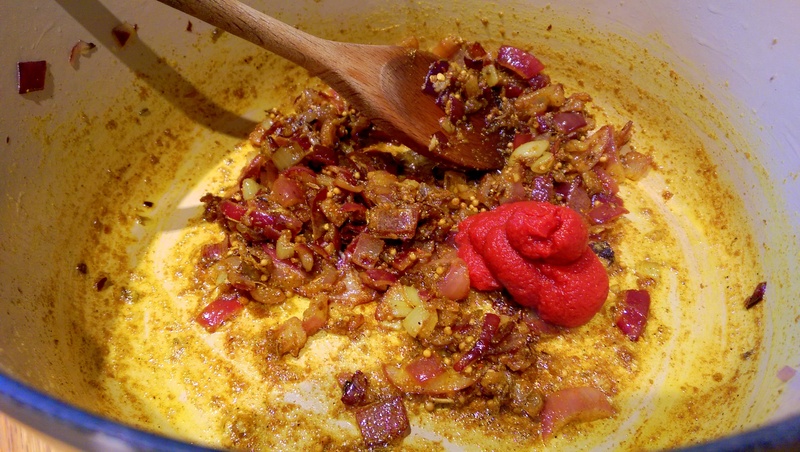 Add the rest of the spices and a decent squidge of tomato puree and continue to stir through well. Add a sprinkling of sugar to take the raw bitter edge off the tomato. Add a few tablespoons of the water from the potatoes, then the potatoes themselves. Coat in the sauce and allow to cook for a few more minutes, stirring gently once or twice to distribute the heat. You don’t want to crumble/mash the potatoes. Top with some chopped herbs and you’re good to go! Posted in Guesscipes, Sauces, Sides and Snacks, VegetarianTagged aloo, bombay, curry, guesscipe, indian, potato, recipe, side dish, VegetarianBookmark the permalink.